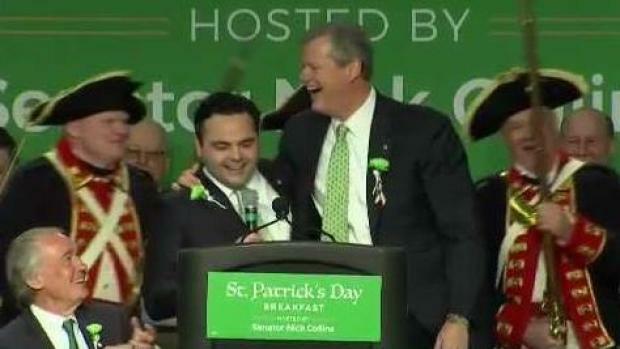 It was a morning full of laughs at the St. Patrick’s Day Breakfast in Boston. Before the parade, the state's political leaders gathered for the annual event in the city's South Boston neighborhood for Irish songs, Irish dancing and groan-worthy political jokes. Senator Nick Collins hosted the event for the first time. It was also the first time the event was held at Flynn Cruiseport on the city’s waterfront. Republican Gov. Charlie Baker was one of the event's headliners. 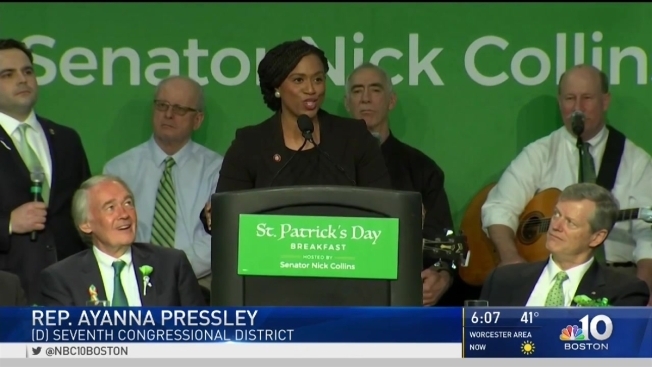 U.S. Sen. Ed Markey, U.S. Rep. Ayanna Pressley and Boston Mayor Marty Walsh were among the top Democrats who attended. Sen. Collins, a native of Southie, poked fun at Baker for his British roots and introduced him as King Charlie Baker. "Alice Elizabeth Gormley from Ireland, my mother, would have been horrified to have anybody talk about me as a descendant of the British crown," said Baker. 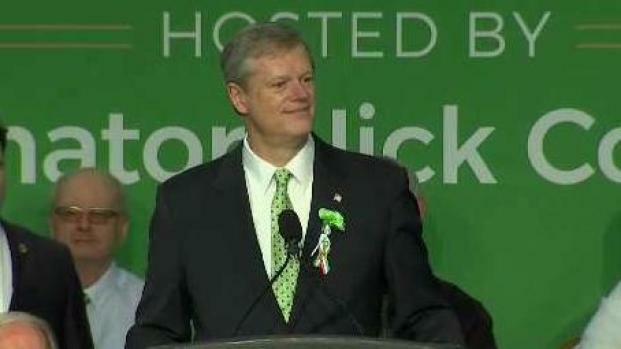 Massachusetts Governor Charlie Baker speaks at the annual St. Patrick's Day Breakfast in Boston. "The official results of that DNA test? I am one-one thousandth Republican,'' Baker quipped. 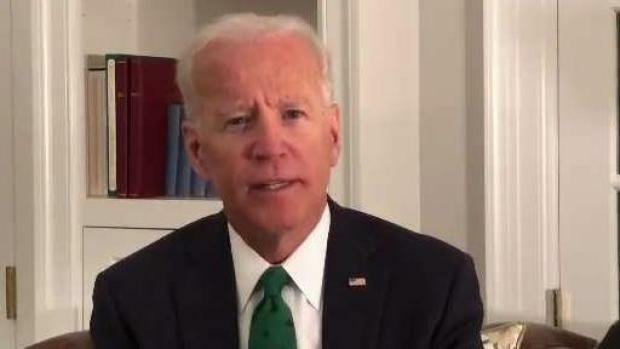 Former Vice President Joe Biden delivers a special video message at the annual St. Patrick's Day Breakfast in Boston on Sunday. Biden revealed how he met Sen. Collins in New Hampshire when they both worked together in 2007 and said he wished he could attend the breakfast to see his colleagues in Boston and to meet new lawmakers like Pressley. The former vice president also spoke of his mother, who he believed was the "quintessential Irish lady." He reflected on an Irish lesson that his mother instilled in him, his sibling and grandchildren: "Never bend. Never bow. Never break." Biden said it taught his family about equality and captured the Irish spirit. "I would say we’re the only people on earth who are always nostalgic for the future," said Biden. "I think the future is going to be bright." Before introducing Gov. Baker, Sen. Collins paid tribute to the Massachusetts governor with a "Hamilton" inspired song and dance number. Baker stood and sang along to the tune. Lawmakers were amused with the skit and Sen. Collins’s attempt at hitting a high note. "I’ve never had men with muskets dance behind me at this breakfast," chuckled Rep. Stephen Lynch as he began his speech. Sen. Ed Markey did an impression of President Trump after telling them to imagine pitching the Green New Deal with Rep. Alexandria Ocasio-Cortez. 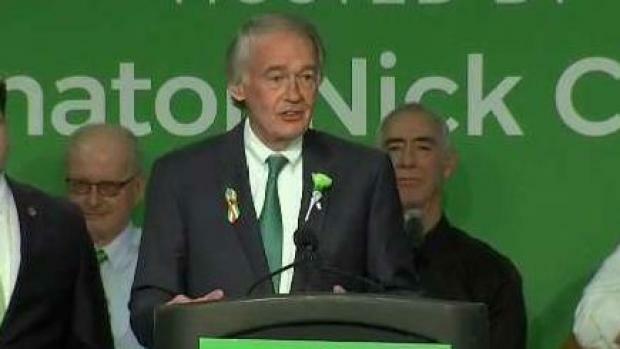 U.S. Sen. Edward Markey (D-MA) attended the St. Patrick's Day Breakfast in Boston. "You’re going to get tired of drinking so much clean water," Markey said as he imitated President Trump’s voice. "You’re going to say ‘Oh please Mr. President we can’t drink anymore clean water.’"
Senate President Karen Spilka revealed a sweet fact about Baker, saying during the weekly leadership meetings that a small buffet is laid out and Baker always goes for the pastries. 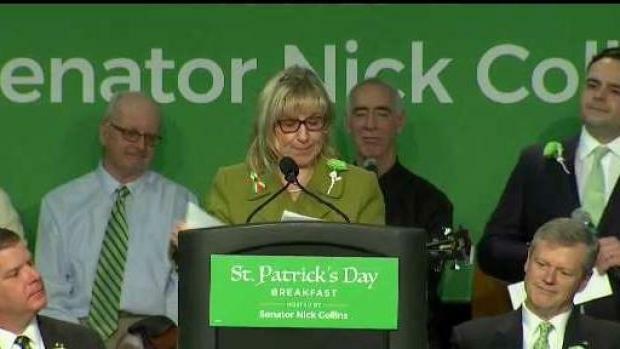 Senate President Karen Spilka cracked a few jokes during the St. Patrick's Day Breakfast. "Every single meeting, Charlie Baker devours all of the pastries," she said as she jokingly gave Baker a cookie. Throughout her speech, Sen. Spilka pulled pastries out of a bag and handed them to the governor. "Ooh, look governor," she said. "Another pastry." U.S. Sen. Elizabeth Warren, who is seeking the Democratic nomination for president, was campaigning in Tennessee and wasn't at the breakfast. Attorney General Maura Healey and House Speaker Robert DeLeo were also not in attendance Sunday. The Boston area has a significant Irish-American population, and South Boston is its historical stomping ground. The breakfast itself dates back more than a century and is a regular stop for politicians courting those of Irish descent.